We have been part of the Fond du Lac community for 75 years, and the Assemblies of God denomination has existed for more than 100 years. 22 people met to plan the formation of an Assembly of God church in Fond du Lac, Wis.
Congregation officialy organized as an Assembly of God church and affiliated with the General Council of the Assemblies of God, Springfield, Mo. 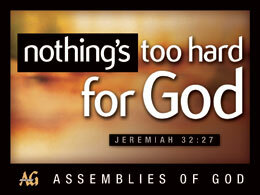 Read about the history of the Assemblies of God at ag.org.